My special gratitude to HH Chandramauli Swami Maharaj, Her Grace Mandakini Devi and Her Grace Kamagiri Devi for their sincere words of enlightenment, encouragement and inspiration. And he told the story of the deities and why they were so dear to Madhvacharya. Srila Prabhupad, he summarizes the story in the Madhya Lila of Sri Chaitanya Charitamrita. These deities, Srila Prabhupad explains or Prabhupad tells the story that when Ram was living in Ayodhyaya, Lord Ram, there was very very great devotee, he loved Ram so much that he made a vow that until he has the darshan of Lord Sri Ramchandra, he will not drink any water or eat any food. And he was an elderly person. So sometimes, Lord Ramchandra, because this is when he was the king after he returned to Ayodhaya from his 14 years in exile, he would sit on the throne and give his darshan to all the people. But sometimes, Lord Ramchandra would leave for some time and one time he was away for 8 days and this old man fasted for 8 days! So when Ramchandra came and sat on his throne and was giving darshan to everybody, this old man, he was really weak, he was practically dying. So Ram told Laxman that, “There is a deity of myself that is non-different than me, you should give that deity to this man. And then he can worship the deity at home and when I am away, he could see me and then he could eat.” The history of that deity, it was, or he was long ago worshipped by Lord Brahma. Brahma presented it to the great kings of the solar dynasty. Maharaj Ikshavaku, worshipped that murthi of Sita Ram in his abode. And as the generations passed and all the great kings of the Raghu dynasty —that was their ishtadeva— that deity of Mularam, which is the name that the followers of Sripad Madhvacharya call, was given to king Dasarath and he worshipped the murthi of Ram, even before Ram was born. And when Dasarath Maharaj departed from this world and Ram, Laxman and Sita returned to Ayodhaya after their exile and after the conquering of Ravana, they came back with Hanumanji and so many other wonderful devotees, Laxman was personally worshipping the deity of Ram. So Ram told Laxman, “Give this old brahman the deity. And that way, if I am not here, he can have darshan of me in the deity and he could eat nicely.” So this deity that was handed down from the time of Brahma, Ikshavaku, Dasarath, Laxman, was now worshipped by that brahman everyday with great love and devotion. After some years, before that Brahman departed from this world, he presented his life and soul, Mulram, back to Laxman. And Ram told Laxman, “Give my form to Hanumanji.” And Hanuman was so ecstatic. He wore the deity of Mulram around his neck, it hung over his heart. For years and years and years, not only years but for an entire yuga, he kept that Mulram on his chest. We know the story of Hanumanji when he was in Ayodhaya once, he saw Sita putting on this red sindhur in the part where her hair was combed in both directions and Hanumanji is a brahmachari, he doesn’t know all the intricacies of why ladies do what they do. So he asked, “Why are you doing like that?” And Sita said, “because it pleases my beloved Ram.” So the next day, from the bottom of his feet to the top of his head, there was a thick layer of this, and Ram said, “What are you doing?” He said, “Sita says, putting this on pleases you, so I want to please you!” that was Hanuman’s devotion. He wanted to please Lord Hari. Once when Ram was in separation and he was crying out for Ram because Ram was not there, a devotee asked Hanumanji, “Why are you crying, crying out for Ram?” He said, “Because I want to see Ram, I am feeling so much separation from Ram. Where is Ram?” He said, “Ram is always in your heart.” Hanuman was so enthusiastic, he wanted to see Ram so much that with his nails, he ripped open his chest and there was his heart and he ripped open his heart! Now if an ordinary person does that, what is their fate? But because Hanuman was completely transcendental to anything except the loving service of the Lord, Krishna tells in Gita that for my devotees, I preserve what they have and I carry what they lack. So he ripped open his heart and he looked and there was Ram and Sita, personally, physically giving their darshan within his heart. And he was happy, “Yes they are in my heart.” And he put everything back nicely. So now this murthi of Mularam and Sita was in the heart of Ram, Hanuman was wearing on a string around his neck over his heart, was his Ishtadeva. In Mahabharat we find the story when Draupadi asked Bhima to collect some flowers for her in the Himalayas and he came upon this big elderly monkey who was in the path and his tail was blocking the pathways. So Bhima, Bhima said, now he is very powerful person, Bhima said, “Please move your tail.” Monkey said, “I am very old and I am very tired, I really can’t move it, you can move it.” So Bhima, he couldn’t lift the tail! And then he realized that he was his brother, this was Hanumanji, and at that time Hanuman was so pleased with Bhima, he blessed Bhima! And what’s the greatest blessing you can give to someone? To give them Krishna. 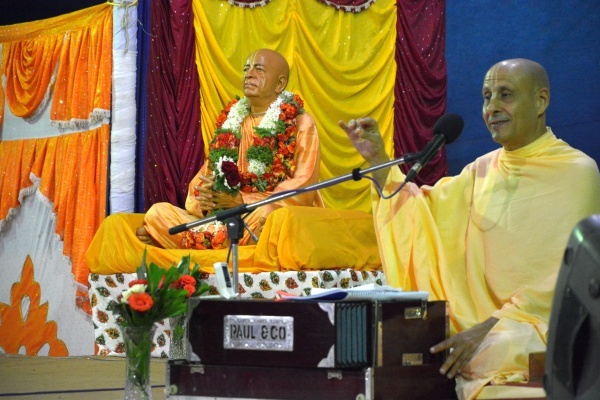 Srila Prabhupad explained amongst ourselves as brothers and sisters in God family, the greatest service we can do for each other is to remind each other of Krishna, to enthuse each other to serve Krishna, to help connect our hearts together with Krishna. So Hanumanji gave Bhima the murthi of Mularam, that have been worshipped from the time of Brahma, from the beginning of the creation. The last king of the Pandava dynasty presented that murthi of Mularam to the Gajapati kings of Orissa who were then ruling over the Kalinga province near Andhra Pradesh. And those kings, it was the treasure of all treasures, so they kept the murthi where they had the most valuable assets of the kingdom. Sripad Madhvacharya told his disciple Narhari Tirtha that “As the son of Vayu, as Hanuman, I worshipped that deity, as Bhima I worshipped that diety, I want to worship that deity. Bring Sri Ram to me. So Narhari Tirtha, instead of coming back to staying in Udupi with all the other sanyasis in doing pujas and doing preaching, he went back to the kingdom of Kalinga, and there, he was just preaching Bhagavat dharma, pure devotional service. Teaching everyone and anyone who would come anywhere in his association directly or indirectly that the soul is eternal and the nature of the soul is it’s an eternal servant of Bhagvan, the Supreme Personality of Godhead. God is a person, but he is the all-attractive Supreme Person and the ultimate aspiration of every soul is to serve that Supreme Person with love. And he was explaining on the basis of so much logic, philosophy and especially of the holy scriptures of how this was the conclusion— the siddhanta. Everyone loved him, not only because he preached so well, but because of his character, his conduct, he was so respectful, he was so humble, he was so gracious, compassionate, self-controlled, he had dignity and integrity in whatever he did. So people, because of his life, they honored what he said. So they had a tradition, that there was an elephant and the elephant had the garland of victory and whoever that elephant gave the garland of victory to would be the next king. Usually the elephant just went up to the son of the king and put it on him, that was the tradition, but now the son was an infant baby, he couldn’t do anything! So the elephant walked right up to the Narhari Tirtha and he placed the garland around him. And they pleaded him, “Please be our king!” He is living as a sanyasi, he is studying scriptures, he is preaching, he doesn’t have anything to do with political matters but Madvacharya actually told him that “In order to get these deities for me, you are going have to become the king.” So he became the king! For many years he was ruling, if you go to Kurmakshetra, which is in Andhra Pradesh, it’s one of the first places that Sri Chaitanya Mahaprabhu is recorded to have stopped at during his South India tour, that is where he met the Kurma brahman. And inscribed within the wall of the temple is the histories there and it refers to Narhari Tirtha, who was the king. Because at one time there was some very very violent, irreligious people who attacked the temple of Kurmadeva and Narharitirtha led an army to save the temple, to save the deities, to save the devotees, to save dharma! When you have to be the king, its not that you just do it the way you like to do it, you have to fight wars, you have to tax the citizens but he did everything with pure dharma, pure integrity. And he never deviated from his consciousness of being a sanyasi! Srila Prabhupad taught us from Rupa Goswami, the concept of yukta vairagya, that sometimes, according to time, place and circumstance in the service of Krishna, we have to do the needful. 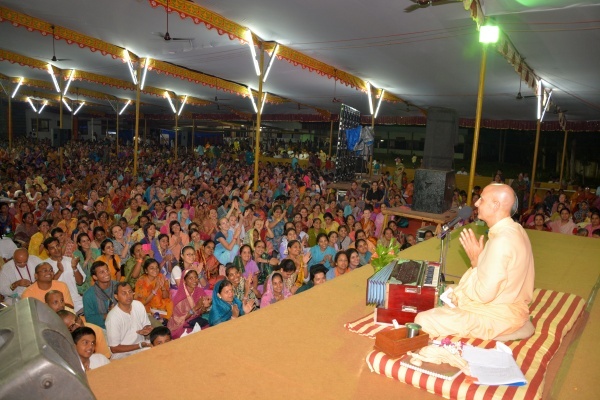 Even Srila Prabhupad in 26 2nd Avenue, New York, some of his devotees were going to get married, Mukunda prabhu, now he is Goswami Maharaj, and Janaki Devi. They were the first devotees in our society to get married. 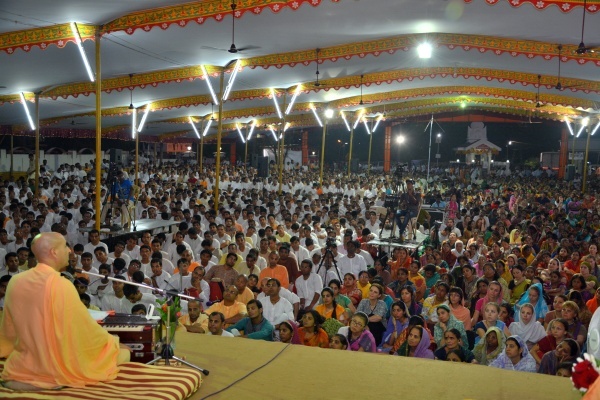 Now nobody knew how to do the fire yagna, so Prabhupad did the fire yagna! He said, “Sanyasis never do the fire yagna for marriages but what to do.” In order to establish his movement, he did. He did so many things out of necessity, out of compassion in the service of his guru Srila Bhakti Siddhanta Saraswati who told him to spread the message throughout the world. So Narhari Tirtha, for about between 12 and 15 years, he ruled over Kalinga as the king, a sanyasi king. He was gentle, he was humble like a blade of grass, but he was the king. So when the child, who was the rightful heir grew up, so he was old enough, immediately Narharitirtha said, “You take the kingdom. I don’t want it. I was just doing it as service to my guru Maharaj and service to all of you.” So the boy who now was coroneted king, he said, “I want to give you a gift, you sustained the legacy of our dynasty for all these years when there was no one else and you did it with such dignity and you expanded our empire! I want to give you a gift, what can I give you, I can give you everything, anything!” Narhari Tirtha said, “In your treasury, there is a deity of Mularam, just give me the deity.” They gave him the deity, that was the whole reason why he ruled over this kingdom for 15 years, is just to serve his Guru Maharaj by bringing back that deity to him because he knew this would please him. This is the consciousness of a devotee, Hanumanji, when we were in Kishkintakshetra discussing, he was jumping over oceans, he was facing Ravana’s entire army single handedly, just to please Ram. And Hanuman, what was his ultimate pleasure? When he could go back to Ram and present the jewel of Sita to Ram. In a similar way, he [Narahari Tirtha] went and for 15 years approximately he ruled over a kingdom, and all of the challenges and sacrifices he went through, and he had the jewel of Mularam. Everything was worth it just to please his Guru. And he came back to Udupi all those years later and presented him to Sripad Madhvacharya. It is described that it was just in the time of Karthik and Sripad Madhvacharya, that morning, he was especially blissful. And they said, “Why, you are always blissful, but today you are especially blissful.” He said, “Because today my worshippable Lord is going to come to me, Mularam” And sure enough, Narhari Tirtha arrived after being away for so long and presented Sri Ram in his beautiful form Sita- Ram to Madhvacharya. Sripad Madhvacharya embraced his disciple, as his disciple was offering his full obeisances on the floor and Madhvacharya picked him up and embraced him, and tears of gratitude, tears of happiness. He installed the deity, he had beautiful abhisek, beautiful yagnas, beautiful kirtan of the holy name to celebrate the coming of the Lord. King Bahulasva was the king of Mithila, the descendent of Janaka, the father of Sita, and Sutadeva was a simple brahman who just lived in a straw hut. And they both offered Krishna, when he came there with Narada muni and other sages, the best they had. One offered him a jeweled throne and the other offered him a straw kusa grass mat. One offered him the most fine foods on gold plates and the other offered him chipped rice he had begged, on a leaf plate. For Krishna, he tasted, he heard, he saw everything completely equal. There was so much variegation in these two people but Krishna was seeing that their only intent was to please him, that’s bhakti, that’s love and that’s the real treasure of life and its that treasure that Srila Prabhupad travelled to the world to give people. When he saw, the wealthiest city in the world at that time Manhattan island of New York City, he was thinking how much poverty because they don’t have that jewel of Krishna, they don’t have that treasure of love of God, nothing else really matters. We have come on this yatra to help each other to be inspired for this purpose, to refocus our attention because we really need that. There are so many distractions in this world, the distractions within our own minds due to our past conditionings. In our earlier life in this body and in previous births, so many samsakaras or tendencies we have accumulated, so many prejudices, so many likes and dislikes, loves and hates in this world of dualities, so many conceptions and misconceptions, especially who we are and who others are, and so much greed and lust, the tendency for envy and anger, and arrogance, and in Kaliyuga there is limitless propaganda to fuel the fire of our distractions. So how to keep focused on the real purpose of life, the real treasure, love for Krishna. Prabhupad was asked “What pleases you most?” Srila Prabhupad said, “When you love Krishna.” That pleases him most. So in this way, these yatras are a wonderful facility, a tradition. 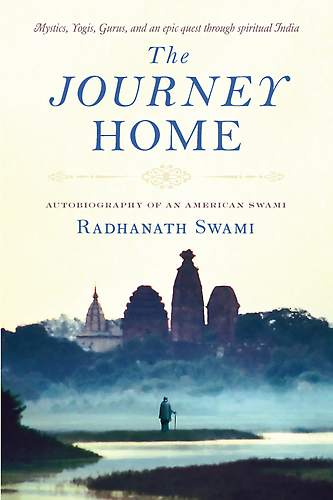 Sri Chaitanya Mahaprabhu, all the great saints, Ramanujacharya, Madhvacharya, they have all inspired these pilgrimages. 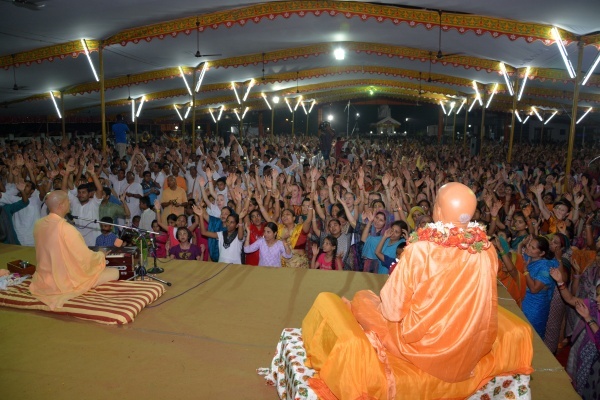 In fact in every great religion there is holy pilgrimages, it is to come together in a setting where we can put all of these distractions aside and just become one in purpose, whether it’s two people or whether it’s 4500 people, to focus our attention that our real goal of life is to connect with that treasure of pleasing Krishna, of being the servant of the servant of the servant, of loving Krishna. And especially in this age of Kali, that treasure the key, the key to access it is in the chanting of the holy names of the Lord. Then we could taste the nectar of the holy names. So the real yatra begins when the real yatra ends. In the sense that a devotee doesn’t eat Prasad just because it tastes good, even though it does taste good. A devotee especially when Gauranga prabhu and when Radha Vallabh prabhu and their team cooks this incredible Prasad. Now we are just eating and we are sitting, they wake up like at two in the morning to do cooking every day and what it takes to cook for 4500 people. All the pots, and they have developed a whole, Vamshidhar Prabhu developed a railway system for these gigantic pots and these gigantic cookers and they have these big trucks that they are loading and sending from the Eco Village in Mumbai and all these different places and they send it all the way to Humpi and they set up a whole kitchen, cooking eight preparation for lunch time for almost 5000 people and getting it on time every day, incredible, huge fires blazing on pots and big ladles being stirred, amazing! And then all of you and me we are thinking ohh now from Humpi we have to take a bus and we have to drive all the way to Udupi. I know it was an inconvenient and I am sorry about that but you know what the kitchen had to do? I was with my dear God brother Sesha Prabhu after the last event in Humpi and we went back to the kitchen and they had all these big trucks and gigantic pots and gigantic cookers and some of the cookers you can’t even move because they are so big! Most of the cookers that they have, they have to build them here with bricks and mud for gigantic pots that are hundreds of gallons, it’s incredible. And they have to pack it all up at night, drive all night long, set it up early in the morning and have lunch for all of us when we get off the busses all tired. And I have been watching all this Prasad being cooked over the years, I have never heard any of them complaining, “This is too much, somebody else should do.” they are just laughing and stirring and cooking and everything so nice because they are doing it with love. And interestingly these people who are driving all night and planning the menus and planning the quantities and cooking it all, it takes months to organize it and prepare it, Not a single one of them is paid one penny or one paisa, they are just doing it to please the Vaishnavas. And we’re happy eating it; but they are even happier going through the sacrifice of making us happy. So when we come in the yatras and we see this, and then there is the people who have to organize the hotels and organize the buses and organize the security and organize, so many other things are going on. Even the finances because we are in this world. Some of these devotees they are really working practically without sleep throughout the whole yatra and there is always things going not exactly right, that they have to be constantly dealing with and fixing and some months they are spending helping with the organization, the accommodations, the travel and they do it as a service. And the interesting thing is it’s never hard to find people to do it because everyone who does it loves to do it. They get nothing but the opportunity to feel the true joy of seva. And many of you, you have come from many different places and some of you your health is not so good, we have people from China and Russia and Iran and America and France and Africa and so many places, so many parts of India, whatever difficulties, it’s what makes the yatra so beautiful, is that we see examples amongst each other of people who really have this focus, samsidhir hari tosanam on pleasing Lord Hari. So let us all very enthusiastically offer our gratitude to all those devotees who have given their lives Sanat Kumar Prabhu and Hari Krishna Prabhu and Radhakund Prabhu and Baldev Prabhu and Gauranga Prabhu and Radha Vallabh Prabhu, so many others, how they have, Syamanand Prabhu, they have just given so much of their life with joy and that’s the part of yatra, to see what the real bhakti is among each other, to imbibe that in our own hearts. 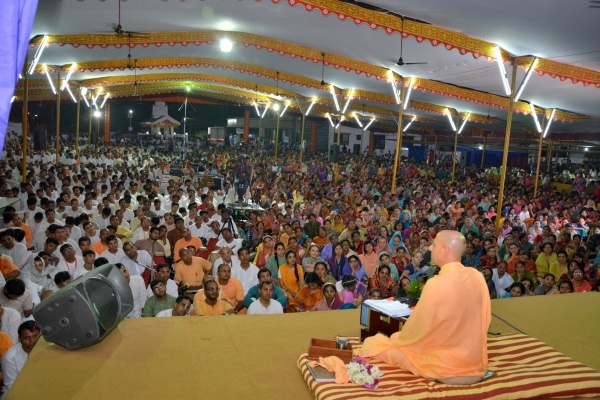 Let us very enthusiastically clap and chant Haribol and everything else to thank these devotees. All you Hanumans have just been embraced by Ram for your great surrender. Thank you, and off course and so many names I did’nt speak because there are so many devotees who have done so much and they don’t even want credit. They just want to see your smile and to see that you are smiling because you are feeling Krishna in your lives. So I am so grateful to all of you for allowing me as small and insignificant and useless I am, to sit here and speak to you every day and your so patient that you listen (at least I think you’re listening) it’s quite incredible. And I am so grateful to Srila Prabhupada.